My family loves cold cereal. You know, the kind that is $5 a box and lasts a bit longer than 30 minutes? However, according to a study , described in “Nourishing Traditions” by Sally Fallon, that was performed in 1960 by researchers at the University of Michigan at Ann Arbor, eighteen rats were divided into three groups. One group received cornflakes and water; a second group was given the cardboard box that the cornflakes came in and water; and the control group received rat chow and water. The rats in the control group remained in good health throughout the experiment. The rats receiving the box became lethargic and eventually died of malnutrition. But the rats receiving cornflakes and water died before the rats that were given the box – the last cornflake rat died on the day the first box rat died. Before death the cornflake rats developed schizophrenic behavior, threw fits, bit each other and finally went into convulsions. Autopsy revealed dysfunction of the pancreas, liver and kidneys and degeneration of the nerves in the spine – all signs of “insulin shock.” The startling conclusion of this study is that there is more nourishment in the box that cold breakfast cereals come in than in the cereals themselves. This wasn’t something I wanted to continue to feed my children. I had to change what I was doing. So, enter in homemade granola! 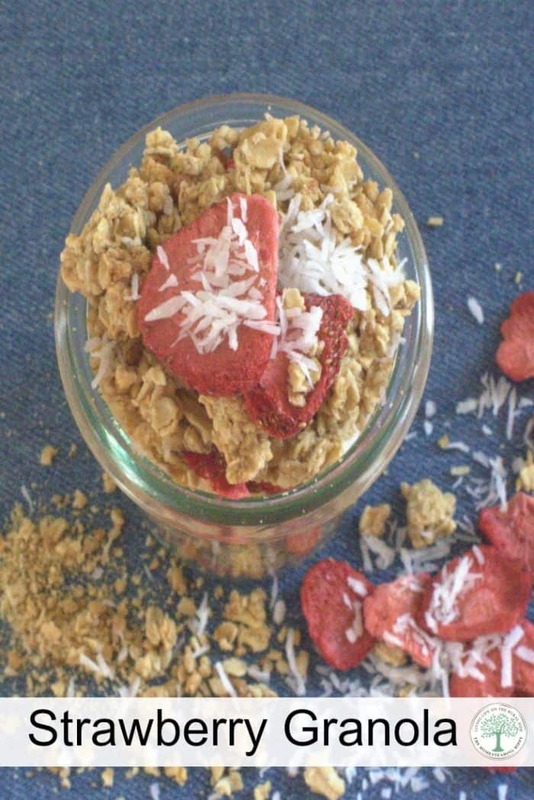 We love adding in the flavor of dried strawberries and coconut to give it a summery, tropical taste. Making your own homemade granola isn’t hard at all. 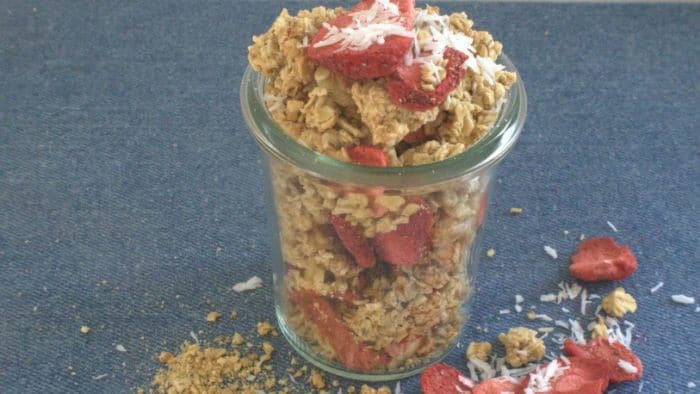 Finally, I hit success with this strawberry granola recipe! 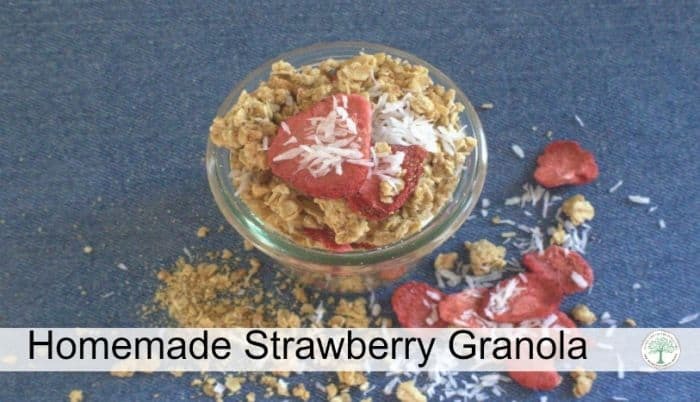 Get a delicious strawberry granola yogurt recipe here, too! add oil and syrup and stir to mix well. Place on a baking sheet and put in oven for 1 hour and 15 minutes, stirring every 15 minutes. I can’t tell you how long this will last, as my family usually gobbles this up within 3 days. I am sure that it could last at least a week, though. How do you make your granola? Be sure to pin this for later! I finally made this. On my way to making most of what I eat now. LOVE LOVE LOVE this one. The taste is amazing!! No, it doesn’t “clump” up in chunks but I am guessing that is because it lacks all that fat. So not a finger food. I eat it on yogurt, cottage cheese, and just in milk. Haven’t made recipes with it yet but will. I also have a favorite bread recipe now that I make exclusively for my daily bread…using sprouted spelt flour and maple syrup. Maple syrup is the most easily digestible sugar for humans. Expensive but worth it. If I eat another bread I can tell by how my body reacts. Gave 2 loaves to a friend who is gluten sensitive and he can eat it also…it is the sprouting that is the trick…would you like the recipe?? Sure!!! Feel free to post it here!